330 pages | 362 B/W Illus. According to urban academic myth, the first restaurants emerged in the wake of the French Revolution. From the very beginning in the elegant salons of the latter days of the Ancien Régime, the design of restaurants has been closely related to ideas of how food should be presented and how it may be consumed in public. The appearance and atmosphere created by restaurant owners reflects culturally embedded ideals of comfort, sociability and the good life. As a product of the modern metropolis, the restaurant encapsulates and illustrates the profound change in how its patrons viewed themselves as individuals, how they used their cities and how they met friends or business partners over a meal. The architectural design of environments for the consumption of food necessarily involves an exploration and a manipulation of the human experience of space. It reflects ideas about public and private behaviour for which the restaurant offers a stage. Famous architects were commissioned to provide designs for restaurants in order to lure in an ever more demanding urban clientele. The interior designs of restaurants were often employed to present this particular aspect in consciously evoking an imagery of sophisticated modernity. 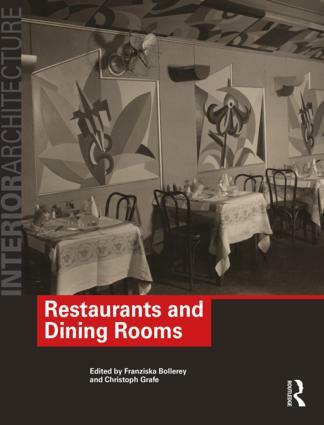 This book presents the restaurant, its cultural and typological history as it evolved over time. In this unique combination it provides valuable knowledge for designers and students of design, and for everyone interested in the cultural history of the modern metropolis. Illustration credits. Notes on contributors. Acknowledgements. Introduction. 1. The Restaurant and the Rise of the Modern "Cuisine" Franziska Bollerey 2. The Restaurant: stage set and functional arrangement, the short history of an impossible typology Christoph Grafe 3. Food and cooking – an anthology of literary and other observations 4. Conditions for the Behaviour of Guests Hermann Czech in conversation with Wolfgang Kos 5. Puck, Pip and PS: the pursuit of pleasure, a designer’s account Mark Pimlott 6. A selection of elements of the restaurant Bas Rozenbeek Case Studies 1. Restaurant Le Grand Véfour, Paris (1820). 2. Restaurant Le Grand Boulion Chartier, Paris (1896). 3. Augustiner Beer hall and Restaurant, Munich (1897-1898). 4. Midway Gardens Restaurant, Chicago (1914). 5. Grand Central Station Oyster Bar and Restaurant, New York (1904). 6. Theatre Restaurant Kroll-Oper, Berlin (1922-1923). 7. Bar-Automatique-Restaurant Presto , no. 1, Paris (1930). 8. Restaurant and Hotel Moskva, Moscow (1930-1938). 9. Gondolen Bar and Restaurant, Stockholm (1935). 10. Restaurant Savoy, Helsinki (1937). 11. Restaurant Meilongzhen, Shanghai (1938). 12. Cafés and Restaurants Roma Termini Railway Station, (1948-1950). 13. Restaurant Moskau, Berlin (1959-1964). 14. Grand’s Restaurant, Philadelphia (1961-1962). 15. Boa Nova Teahouse and RestauranT, Leça da Palmeira (1958-1963). 16. Neal Street Restaurant, London (1972). 17. Restaurant Centrale, Beirut (2001). 18. Restaurant Belgo Centraal, London (1994). 19. Restaurant Flash, London (2008). 20. Le Lieu Unique Restaurant, Nantes (1998-2000). Select bibliography. Index. Franziska Bollerey is Professor Emerita of History of Architecture and Urbanism at TU Delft and Head of the Institute of History of Art, Architecture and Urbanism – IHAAU. Her fields of special interest are utopian concepts, metropolises and the urban history and architecture of the 1920s. She has been a visiting professor and researcher at various universities in Barcelona, Braunschweig, Berlin, Budapest, Istanbul, New York and Zurich. Further, she has published numerous books and articles, some of those are: Architekturkonzeptionen der utopischen Sozialisten (2nd ed. 1991), Cornelis van Eesteren. Urbanismus zwischen de Stijl and C.I.A.M. (1999) and Myth Metropolis. The City as a Motif for Writers, Painters and Film Directors (2nd ed. 2010). Among memberships in international boards and committees, she was Head of the Bauhaus Scientific Advisory Board of the Bauhaus Foundation Dessau until 2013. She is also Founder and Editor of the architectural journal Eselsohren, published at the University of Wuppertal. Christoph Grafe is an architect, curator and writer. He is Professor of Architectural History and Theory at the University of Wuppertal, Germany. A graduate of TU Delft, he worked in practice in Amsterdam and studied in the Histories and Theories Programme at the Architectural Association School in London. Besides teaching architectural design and history in, among others, Delft, Milan, London and Antwerp, he has published widely on post-war European architecture and the history of the modern city, including People’s Palaces – Architecture, Culture and Democracy in Post-War Western Europe (2014) discussing the architecture of post-1945 public buildings for culture. Grafe is a member of the editorial board of the Journal of Architecture and has been an editor of OASE since 1992. Together with Franziska Bollerey, he is editing the architectural journal Eselsohren, which is published by the University of Wuppertal. He served as Director of Flanders Architecture Institute in Antwerp from 2010 to 2017. This series investigates the historical, theoretical and practical aspects of interiors by subjecting the results of current design activity and historical precedents to academic examination, discussing them both in terms of technical solutions and against a wider cultural and historic background. The volumes in the Interior Architecture series can be used as handbooks for the practitioner and as a critical introduction to the history of material culture and architecture.